Sum of 2 + 8? Sum of 10 + 8? RollControl™i includes the Groove Cutting software feature as an option. Both radial and spiral grooves can be cut automatically. Work is efficient and produces regular, precise grooving all the way through the roll face length. 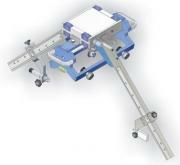 The delivery can include the RollGroove™ Cutting Tool device. Calibration service available please ask for a price. All specifications, illustrations and descriptions of products are intended to give a general idea of the products available and are subject to alteration. We reserve the right to substitute an alternative of similar specification at our discretion. We have taken all reasonable steps to ensure the accuracy of product information provided, but we accept no liability for any errors or omissions.